Collage #1: Dated from the morning of 6 March 2010, this nuanced piece of work shows a boy and his car as they go off on adventures in the park. Notice the subtle hints of colour linking boy and car, the green a tribute both to the naturalistic setting, as well as to the snot flowing freely from the boy who has caught yet another bug while at daycare. The splashes of red allude not just to the fiery personality of the male subject, but also to the broader context of transport - note how the boy's shoes and his car's wheels are an almost identical shade of red. Sorry to all for the long silence on this poor neglected blog! It was amazing to watch him gradually get more comfortable and secure at childcare. And on the Monday of the fifth week, he happily marched in, let me take of his shoes, grabbed his water bottle, and WALKED STRAIGHT IN. Without looking back. On the Tuesday, he turned back and waved goodbye and SMILED! I almost fainted from shock but stood as if like a smiling pillar of salt, one hand raised in a big wave. And on Wednesday, he laughed as the teacher checked his temperature and sanitised his hands, waved and again walked in. It's been like that since and we are now into the seventh week at childcare! I wish I could capture this precise moment in our lives, because it honestly feels like we've achieved a lovely balance. Jordy seems to be happy at his playschool, he eats and rests well there (he's known as as "third helping" boy, and settles for his two hour nap very easily, doesn't even need patting to sleep! ), he's learning new things everyday (e.g. he now knows how to pump a soap bottle, take some soap in his hands and wash them!, he dances to "If you're happy and you know it stamp your feet" and "Ring a ring a roses") and settles back into homelife pretty well after school. As for me, I'm loving being back at work. I thought I would feel some kind of disconnect, or at least experience some jarring moments here and there. But truthfully? It probably took me a day to transition back to work, I don't really feel like a fish out of water, and it's amazing how wearing nice clothes, some lip gloss and slipping on a pair of heels can transform how you feel inside. And the other thing? I'm loving getting back on the exercise bandwagon. It's gym day and swim day for now, but I may look to add a "walk up Fort Canning Hill" day to the week. But I'm easing into it. Weekends are more precious, and I probably enjoy my time with Jordy more now, as I have time to miss him. One of the girls asked me at dinner last night if I thought about Jordy a lot at work, and again, honestly? I don't really. I think it's because I work only four hours a day and in those four hours, I feel like I'm making every minute count work-wise. It's like I'm a living PR Agency time sheet where I can account for my time for each project I'm working on! Anyway I'm only into my fifth week back at work so ask me again in a few months and you might get a different answer. Which brings me back to how I wish I could freeze this moment 'cos it's feeling pretty sweet. As a tribute to a recent book I read, the excellent Notes from an Exhibition by (the ridiculously good looking) Patrick Gale, I present to you, more notes from an (incredbly overdue) exhibition. All artwork created and curated only this morning! A Study in Animism: Here, the boy is shown in a rare state of spiritual reverie. Eyes downcast, he is at peace with the natural world, his energies and intent focused on the green car wrapped in his hands. He is also bowing in the direction of McCafe, which is the traditional scene of post-play replenishment and redjuvenation. Mother and Child: Through the ages, the mother and child prove to be an enduring subject for artists. In this case, the mother points out the myriad kites gliding through the sky to her firstborn. Excited, he raises his hands and says triumphantly, the word "Geh!" Still Life #2: Boy scanning the horizon. 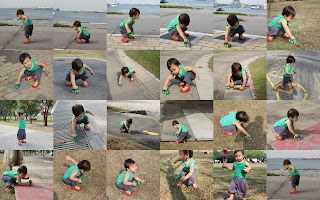 In this closer study of the Everyboy, he is once again clad in green, set against the backdrop of the urban/natural dichotomy - in this case, the maritime/oceanic split. Notice his resolute half-smile as he ponders what is to come, determined to tackle head on whatever comes his way. I simply love his stamping of his foot when we belt out, " If you're happy and you know it stamp your feet"...! He is a joy to watch!